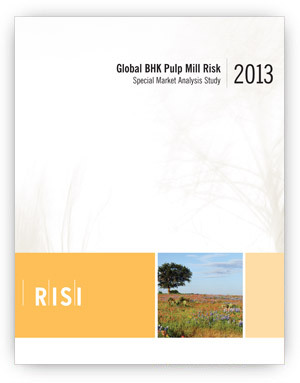 Global BHK Pulp Mill Risk - Fastmarkets RISI - Objective Insight. Better Decisions. A detailed risk assessment of potential BHKP mill closures over a two year time span with mill level competitive cost analysis. Assessment of all market BHK pulp lines in current operation. Identification of specific BHK pulp lines and mills at risk of closure. Which companies regions have the highest risk of closure. Prices at which these mills will be likely to close down. How company strategies affect shutdown risk. From late 2012 to late 2013 the Bleached Hardwood Kraft Pulp (BHKP) market is experiencing a large wave of capacity coming on stream. Continuing into early 2014, new market BHK pulp capacity will likely reach 5.0 tonnes, making up about 15% of the existing market. With demand growth of BHK pulp slowing, prices are facing considerable downward pressure as new capacity enters the market. As this trend continues, lower BHK pulp prices will trigger a number of adjustments in the industry. It is expected that small, high-cost market BHK pulp mills will close, and some companies that make their own BHK pulp internally will shut down existing pulp lines to buy cheap market BHKP. 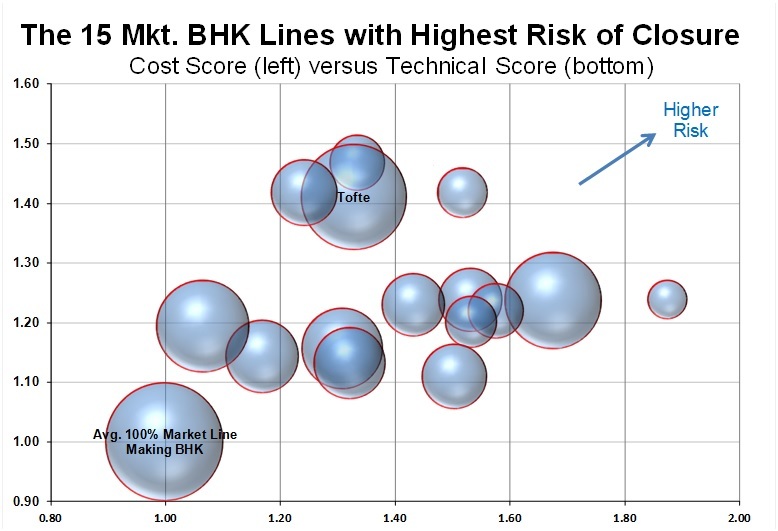 Global BHK Pulp Mill Risk provides a comprehensive overview of the current BHK pulp landscape, identifying all market BHK pulp mills at risk of closure over the next two years. This in-depth assessment uses at least seven data elements for each mill to determine and rank its relative risk of closure or conversion to another grade (such as dissolving pulp). Cash Cost Curves are generated with Fastmarkets RISI’s Mill Intelligence Service. These use a scale to rank competitiveness based on a pulp line’s weighted cash manufacturing cost per unit of production. Cash manufacturing cost includes all of the direct costs involved in production of a finished product, including a summation of fiber, energy, chemicals, labor, material and maintenance costs. Regional differences in these costs are also factored into the calculation. Cash costs in US dollars were used to determine which pulp lines would be most at risk if costs remain about where they have been recently. Because large swings in exchange rates are occurring and can be expected to continue, there can be limits to assessing closure risk over time by using today’s exchange rates. Key technical characteristics of individual pulp lines that do not change with exchange rates include capacity, technical age, dryer speed, and access to international shipping. How important is the pulp line in terms of the overall size of the company and in terms of the company’s longer-term strategies.